Averianov A.O. and Archibald J.D. 2017. Therian postcranial bones from the Upper Cretaceous Bissekty Formation of Uzbekistan. Proceedings of the Zoological Institute of the Russian Academy of Sciences 321(4): 433–484. Averianov A.O. and Skutschas P.P. 2017. A new lithostrotian titanosaur (Dinosauria, Sauropoda) from the Early Cretaceous of Transbaikalia, Russia. Biological Communications 62(1): 6–18. Averianov A.O. , Lopatin A.V., Skutschas P.P., Ivantsov S.V., Boitsova E.A. and Kuzmin I.T. 2017. An enigmatic multituberculate mammal from the Early Cretaceous of Siberia, Russia. Journal of Vertebrate Paleontology. Zverkov N.G., Averianov A.O. and Popov E.V. 2017. Basicranium of an elasmosaurid plesiosaur from the Campanian of European Russia. Alcheringa. Zelenkov N.V., Averianov A.O. and Popov E.V. 2017. An Ichthyornis-like bird from the earliest Late Cretaceous (Cenomanian) of European Russia. Cretaceous Research 75: 94-100. Averianov A.O. , Sues H.-D., Dyke G.J. and Bayshashov B.U. 2017. Hind-limb bones of an ornithomimid dinosaur from the Upper Cretaceous Bostobe Formation, northeastern Aral Sea region, Kazakhstan. Palaeoworld 26(1): 194–201. Averianov, A. O. and H.-D. Sues. 2017. Review of Cretaceous sauropod dinosaurs from Central Asia. Cretaceous Research 69: 184-197. Averianov A.O. , Martin T., Skutschas P.P., Danilov I.G., Schultz J.A., Schellhorn R., Obraztsova E., Lopatin A.V., Sytchevskaya E.K., Kuzmin I.T., Krasnolutskii S.A. and Ivantsov S.V. 2016. Middle Jurassic vertebrate assemblage of Berezovsk coal mine in Western Siberia (Russia). Global Geology 19(4): 187-204. Averianov, A.O. , 2016. Frontal bones of non-avian theropod dinosaurs from the Upper Cretaceous (Santonian–?Campanian) Bostobe Formation of the northeastern Aral Sea region, Kazakhstan. Canadian Journal of Earth Sciences 53, 168-175. Averianov, A.O. , Danilov, I.G., Skutschas, P.P., Kuzmin, I.T., Sues, H.-D., Dyke, G.J., 2016. The Late Cretaceous vertebrate assemblages of Western Kazakhstan. New Mexico Museum of Natural History and Science Bulletin 71, 5-17. Averianov, A.O. , Archibald, J.D., 2016. New evidence on the stem placental mammal Paranyctoides from the Upper Cretaceous of Uzbekistan. Palaeontologia Polonica 67, 25-33. Brusatte, S.L., Averianov, A.O. , Sues, H.-D., Muir, A. and Butler, I.B. 2016. New tyrannosaur from the mid-Cretaceous of Uzbekistan clarifies evolution of giant body sizes and advanced senses in tyrant dinosaurs. Proceedings of the National Academy of Sciences USA 113(13): 3447-3452. Averianov, A. O. , and A. V. Lopatin. 2016. Fossils and monophyly of Afrotheria: a review of the current data. 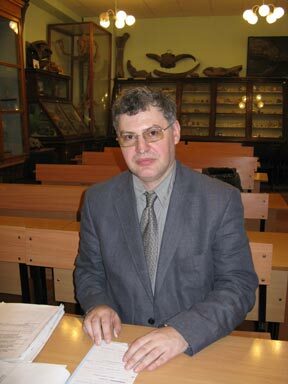 Archives of Zoological Museum of Lomonosov Moscow State University 54:146-160. Averianov, A. O., and H.-D. Sues. 2016. Sauropod teeth from the Upper Cretaceous Bissekty Formation of Uzbekistan. Historical Biology. Skutschas, P. P., E. A. Boitsova, A. O. Averianov, and H.-D. Sues. 2016. Ontogenetic changes in long-bone histology of an ornithomimid theropod dinosaur from the Upper Cretaceous Bissekty Formation of Uzbekistan. Historical Biology. Averianov A.O. , Danilov I.G., Jin J. and Wang Y. 2016. A new amynodontid from the Eocene of South China and phylogeny of Amynodontidae (Perissodactyla: Rhinocerotoidea). Journal of Systematic Palaeontology. Averianov A.O. 2015. Taxonomic revision of tribosphenic mammals from the Lower Cretaceous Antlers Formation of Texas and Oklahoma, USA // Proceedings of the Zoological Institute of the Russian Academy of Sciences. Vol. 319(2). P. 141–181. Averianov A.O., Martin T. 2015. Ontogeny and taxonomy of Paurodon valens (Mammalia, Cladotheria) from the Upper Jurassic Morrison Formation of USA // Proceedings of the Zoological Institute of the Russian Academy of Sciences. Vol. 319(3). P. 326–340. Archibald, J.D. and Averianov, A.O. 2006. Late Cretaceous asioryctitherian eutherian mammals from Uzbekistan and phylogenetic analysis of Asioryctitheria. Acta Palaeontologica Polonica 51(2): 351-376. Archibald, J.D., Averianov, A.O. and Ekdale, E.G. 2001. Late Cretaceous relatives of rabbits, rodents, and other extant eutherian mammals. Nature 414: 62-65. Averianov, A.O., Archibald, J.D. and Ekdale, E.G. 2010. New material of the Late Cretaceous deltatheroidan mammal Sulestes from Uzbekistan and phylogenetic reassessment of the metatherianeutherian dichotomy. Journal of Systematic Palaeontology 8(3): 301-330. Averianov, A.O. and Godinot, M. 2005. Ceratomorphs (Mammalia, Perissodactyla) from the early Eocene Andarak 2 locality in Kyrgyzstan. Geodiversitas 27(2): 221-237. Averianov, A.O. and Lopatin, A.V. 2008. "Protocone" in a pretribosphenic mammal and upper dentition of tinodontid "symmetrontans". Journal of Vertebrate Paleontology 28(2): 548-552. Lopatin, A.V. and Averianov, A.O. 2006b. An aegialodontid upper molar and the evolution of mammal dentition. Science 313(5790): 1092. Martin, T. and Averianov, A.O. 2007. A previously unrecognized group of Middle Jurassic triconodontan mammals from Central Asia. Naturwissenschaften 94(1): 43-48. Martin, T., Averianov, A.O. and Pfretzschner, H.-U. 2010. Mammals from the Late Jurassic Qigu Formation in the Southern Junggar Basin, Xinjiang, Northwest China. Palaeobiodiversity and Palaeoenvironments 90(3): 295-319.